Avid BB7 are one of the best mechanical brake systems providing excellent stopping power with both pads being fully adjustable. 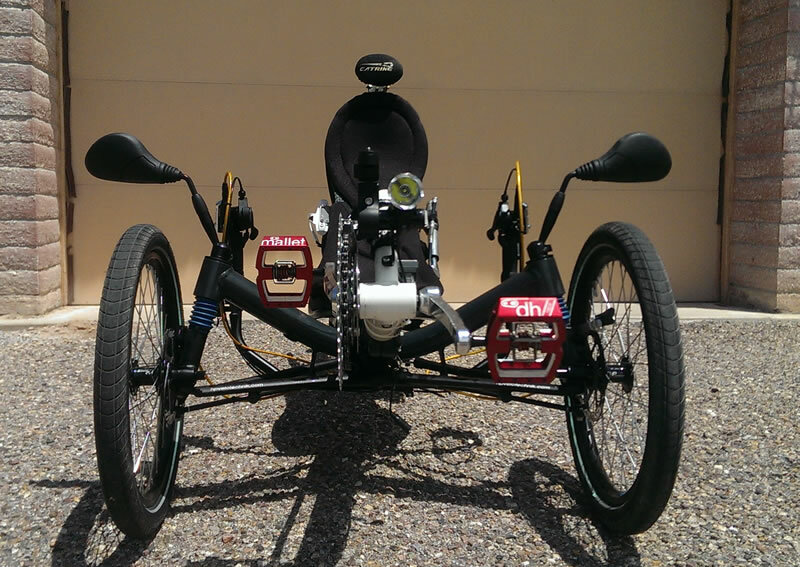 They come standard on most of the upper end trikes as they did with the HPV FS26. Mechanical brakes do have their limits. With the BB7's serving double duty to stop and provide parking brake meant it needed a separate parking brake. A $10 Squeezy Caliper was attached to the rear wheel on the swing arm posts provided by HPV. The 8 speed twisty shifter that came with the original 8 speed DD3 was used for the parking brake - it matches the DD3 hub shifter for a symmetrical look. Also works better then the original parking brakes. 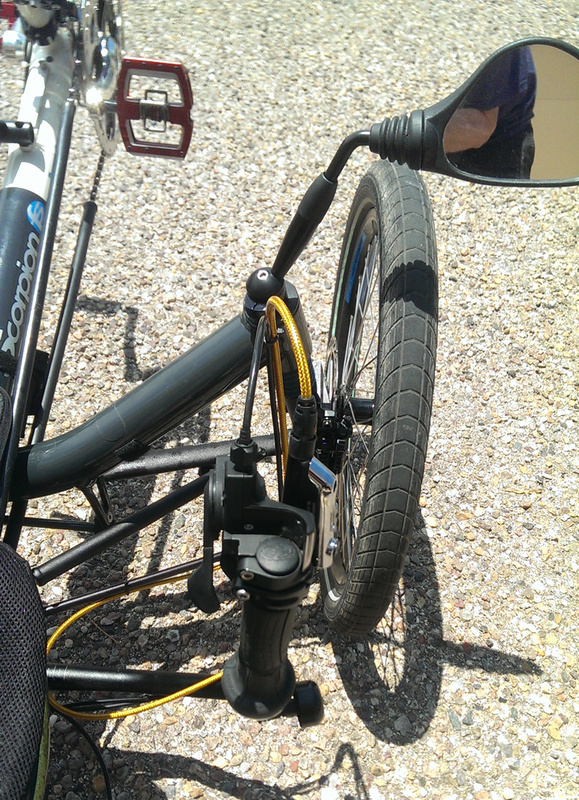 Considering the trike has trigger shifters and that the brake levers are short length it was essential to mount the brake handles correctly rather then inverted for cleaner cable routing. 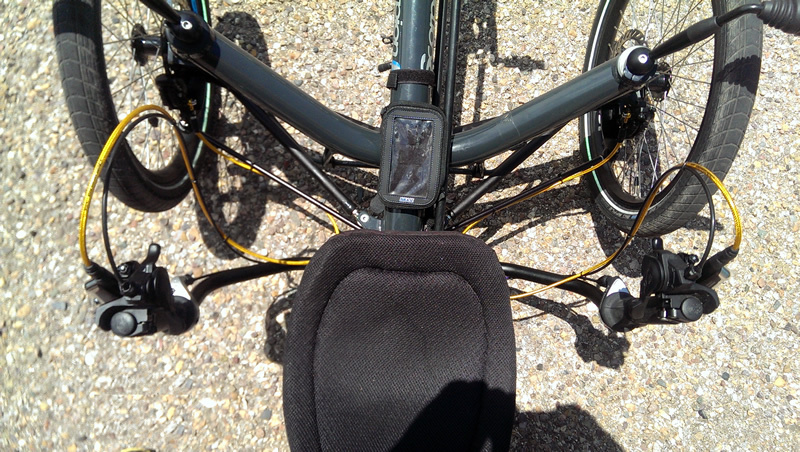 Trigger shifters allow fingertip rapid shifting without hand motion. With proper position of the brake lever braking becomes one finger as well. Mounting the brake levers invoked...Ooops. Front brakes are left side levers with the master cylinder rotated anti-clockwise to the lever so it faces up for bleeding. Right side levers have the master cylinder clockwise to the lever. 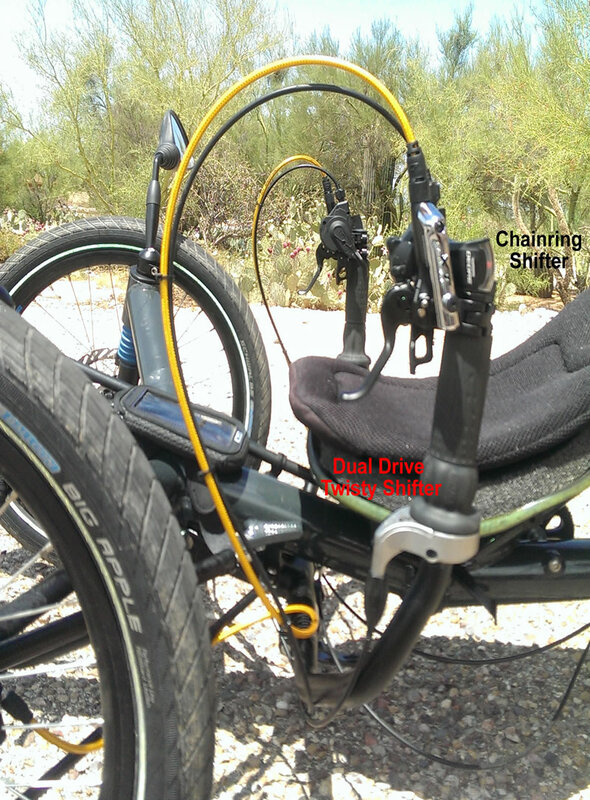 While that wouldn't matter on a trike, at least not with a bar-end or a twisty shifter, it does matter with a trigger shifter. Fortunately Jenson has the right hand levers in stock. 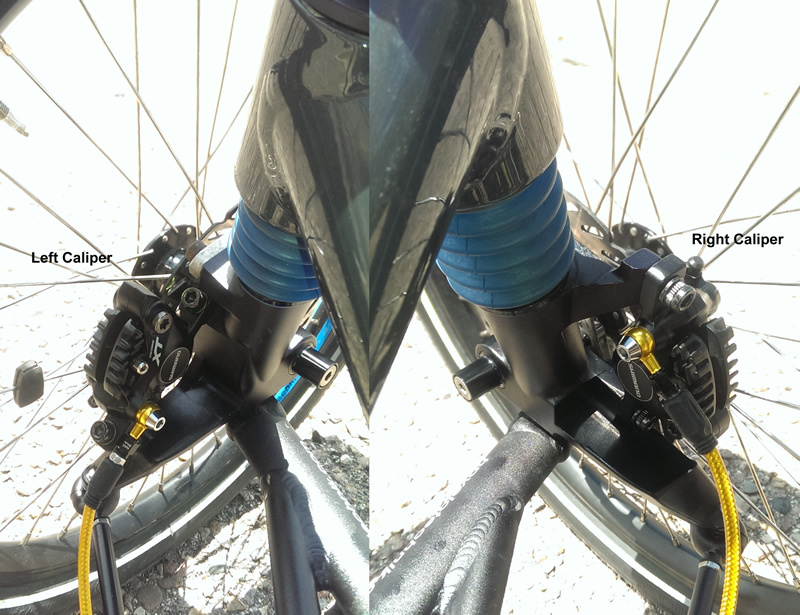 FWIW, the rear calipers are not compatible with brake mounts designed for front brakes and geometrically different. Unless you're using trigger shifters its pretty safe to just order two front brake kits. The standard 1M length for the front caliper was the perfect length for an HPV with the levers on top of the bar. Inverted mounting would favor shortening the hoses by about a foot. Bleeding the brakes isn't too difficult so long as you have the syringe kit, master cup and an understanding of how to bleed brakes. A liter of fluid and the syringe/master cup kit will run about $60 and that's with a lifetime supply of fluid. Also in the M785 kit some yellow blocks are supplied - remove the pads and install these blocks to bleed. Don't lose the blocks. 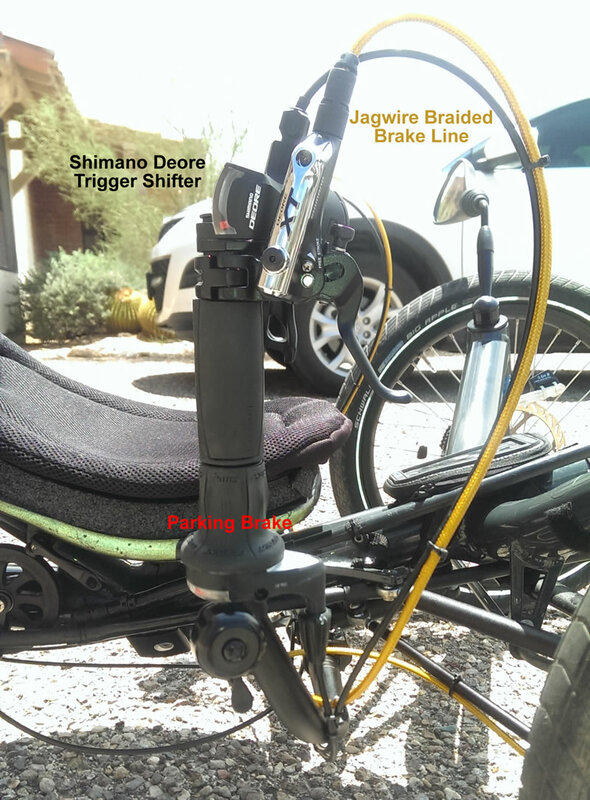 The Jagwire lines are more then just a nice bit of bling; the hose diameter is larger to allow less fluid friction and they have an aramid braided sleeve that reduces expansion as the fluid pressure build on braking. When the OEM lines swell it increases lever travel; the Jagwire lines have about 1/2 the travel as pressure builds. Really enhances and already exceptional level of control. Shimano M785 brakes come with "Ice Tech" pads that have heat sinks fastened to them. Heat sink works very well. The pistons are made of a ceramic material which significantly reduces heat transfer from the pad to the mineral oil based fluid. With mechanical brakes the cable housing tends to compress under load and the mechanical cam mechanisms are a bit dodgy at best. What that means is the brake pads need to be adjusted to run rather close to the rotor so the rider doesn't use up all the travel in the lever to clamp down the pads. Hydro brakes allow more rotor clearance to the rotor. As all rotors will warp, Hyrdro brakes are much more forgiving. You will only want to use 160mm rotors. Shimano has a really nice set of rotors (Ice-Tech) that have an aluminum hub; these will fit any caliper, and are much more warp resistant, not to mention competitive priced with stamped rotors. Performance is nothing short of stellar. The controllability factor is totally linear with pressure and one finger is all that's needed. The M785 is every bit as advanced over the BB7 as the BB7 is over Rim Pull brakes. Reliability is yet to be determined. Very few reports across the internet of any problems that weren't caused by the user. Touring purists who insist on possible repairs while in the middle of the Gobi Desert won't be buying these brakes. Because the M785 has become commonplace with OEM bikes they can be serviced in just about any city with a population over 200,000.